I've been fine. A few bumps in the road but life has been manageable. Happy for you moving out with Cat, sounds like a blast. Whimsi is fine as well. Do you stay in contact with her? It has definitely been some time. I already bought Ultra Sun. However, I'm drowning in work and haven't really been able to play a lot ): How about you? So reun what u doing after VR is gone? How's Vegas been treatin' you? I remember when you first started going to events with Cat and now you went and moved out there with him! Wish I could go out there to visit my old forum buds but I'm stuck out here in Illinois for now .-. Also, I apologize, responding a month later lol. Haha, yes I'm still alive. College is treating me pretty nice, it's lots of fun! Must be exciting to have graduated. I'm enjoying it while it lasts before I have to become an actual adult lol. Hey, just randomly remembered this place today and am scrolling through... MAJOR nostalgia. Looks like I came back just in time to say... happy birthday!!! Now, don't think I forgot about you! Happy birthday, Jelly Belly! Thank you for leaving one of those in the back of my car, remind me to hit you upside the head with it. Do you like warmth? You'll have plenty of chance to be stockpiling it. Hey. I'm wondering if it's ok if my brother joins this forum with me, please. If you were ever on we could do that weekends are your best shot though the next two I'll be out of town. Oh you know, it's been cool. I joined the glee club and went to Argentina for spring break. How've you been? Ugh, why are you even here? 21 already? I hope your birthday goes well. I sure did, thanks man! And a good one to you, too! Part time working for my dad digitizing his files since that is how things are going. Not to mention how much bloody room the files take up physically. So lots of fighting with the scanner which is fun. Ah so you and my brother start around the same time. Beyond that Terraria, having skelletor kick my rear and saw and old friend some time ago. Been way busy. What about you? How's college treating you so far, assuming that it has started up again? Maybe, if I have time with all this SCHOOL that's going on. Did you get that one PM I sent you? I forgot to mention, I finally met Joel last Sunday. He is like the coolest little dude ever. And I almost forgot why we're such good friends. Now it's your turn you big lump of person, you. Your 2 options are 1. Run and 2. TAAAAAAANK! It was fun catching up. We should talk more often. Generally the best tip is that Ana is the only sterile Snowmannian. Good luck playing the game when you get ASTHMA ATTACKS of all things. Well you know how Mr. Carpainter of Earthbound and the Masked Man of Mother 3 kill you instantly with lightning? Well lightning can't do that in Eathbound Zero. PK Beam Gamma has that effect. The dungeon to exit Magicant even is super hard in the Japanese version. The Franklin Badge cannot be equipped and SURPRISE SURPRISE does not reflect lightning. I'll let you know I think I just need to clear one more gracie check before I can finally upgrade my nook store, it's the red one right now. Modern is the worst one to get because there is almost nothing and it's not cloths I keep. Lol that sounds about right. Mother is the hardest game in the whole series. There are two of those zombie NPCs, totally freaked me out during my first playthrough. Though I suppose I should leave you at ease, even though this game is ridiculously hard, it's the watered down version of the original Japanese game. So, good luck. Also, carry the Franklin Badge. You get two of them. Use them wisely. EARTHBOUND ZERO IS NOW OFFICIALLY ON THE NINTENDO eSHOP! THAT'S RIGHT, FOR THE FIRST TIME THE MOTHER GAME HAS ACTUALLY BEEN RELEASED IN AMERICA!!!!!!!! NINTEN ANA LOID TEDDY! Hey I need some help with a bloody Gracie check. I like the second one, so they can make out str without having to level up. It's the only class I don't have so far. I do have three of the class you start out with among other stuff. How many members you got so far? I'm too cute to be scary. haha, a bit weird! 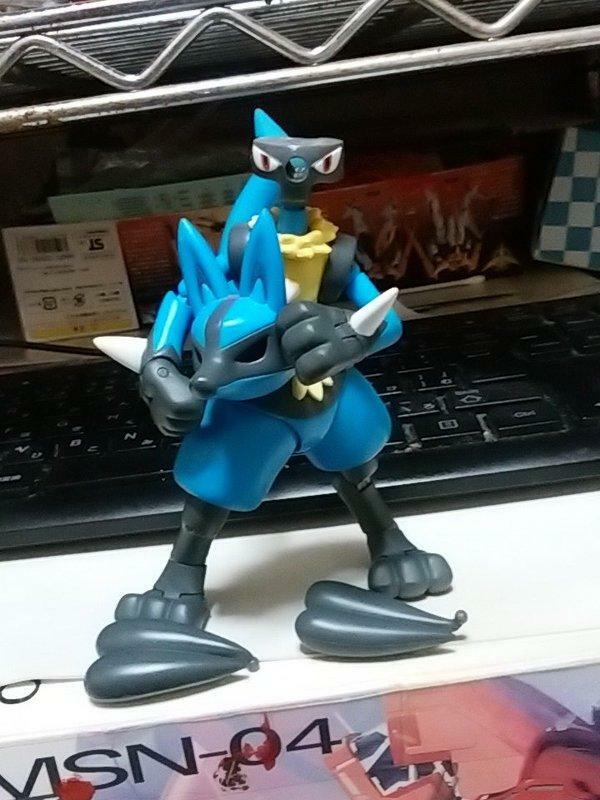 but lucario is awesome, so i don't blame ya! reuniclus still your fav pokemon? Until midnight, but for special reasons. You remember your birthday, right? I only need your ears. It is 2:36 am and I am writing my paper while listening to the BW2 soundtrack. That can probably be arranged. Mine was this week, but I normally find some free time. How...how did you get a chance to play M2K...? Beat the big yellow bird finally, only went after it after clearing out all the stupid deamons that were resistant to elemental attacks. Still took forever. Yeah figured flash bombs would do that if there wasn't a place on the map to keep the idiots to show up, certainly know which ones I don't want to show up, hint instant kill or confusion creating. Alright finally back to the annoying electric bird of death. I assume that you can't rid the area of all the FOE's correct? I'm dark and I'm fly, I'm the head Honchcrow. It certainly has been awhile XD I've been great! How about you? Yeah though I got lost for a couple weeks by grinding for the same turn ins. I now have all the skill slots unlocked which is great. But beyond Desmond stock being 6 everything is 25+ which is helpful. Yay execution of the black Samurai. Also need a ton more app points which is exciting. Lot of grinding trying to get past tourtaments premails which isn't going to well as I continue to grind. Art thou at the airport? We Like to Chew on Ice Cubes!